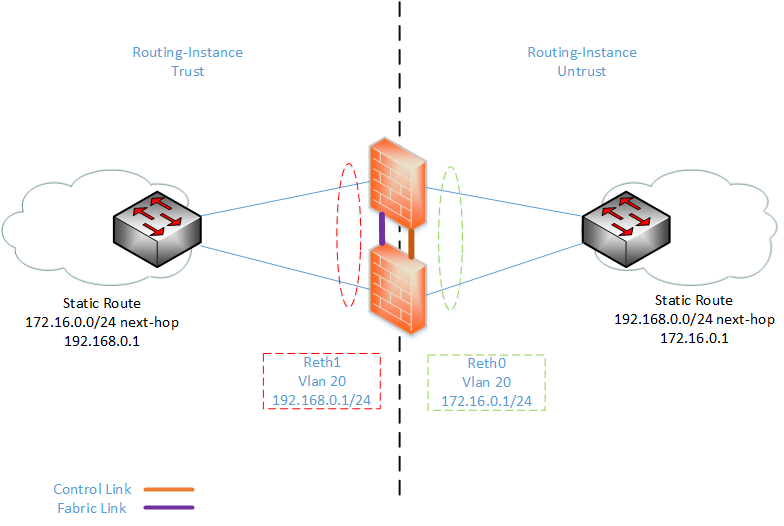 What if we use two downstream links from the SRX to EX for each vlan. Should we also aggregate the links on the EX switch or just use simple trunks and an upstream cluster will aggregate them by itself. Please post yourcpnfiguration in that case also. Waiting eagerly for your kind reply. Can the SRX reth interfaces be connected to Cisco switches instead? What will the configuration needed on Cisco switch? although i havent tried it myself i dont see why it should be an issue, from the srx ill assume you are running vlans down? if so you would just need to have the those ports configured as trunks and set vlan-tagging on the reth interface in question. No problem with Cisco switch. Now I am trying to trunk the vlans over to another srx100, I am following your configuration of EX4200. But it’s not working, is there any additional settings needed on srx100 instead of EX4200? how the Fw identifiy ge-0/0/5 & ge-3/0/5 are control link connections ? is there any config needed for ge-0/0/5 & ge-3/0/5 (control link) ? excellent work I must say, very well detaiiled ! You put all physical interfaces into the redundancy-group 1. Now, what happens If node0 is primary and 3/0/1 goes down ? 1/ Node1 will get primary. Trafic can go through , using path : 1/0/1 – node0 – node1 – 3/0/2 ? 2/ Or the SRX is ‘smart enough’ not to switchover, because the new primary node (node1) would have a port down, and then this would lead to extra inter-SRX traffic (as shwon in the path in the option1 above) ? Indeed I have a issue with the redundancy on my SRX’s and need to understand how this works.